‘Eventful’ is probably the best word I can use to describe our recent group trip to Belize. This year we were based at ‘Clive’s Place’ in ‘Monkey River’ village, as our previous base for these trips, ‘Stepping Stones’, has been sold. Clive’s is a very basic, motel style accommodation, but what a truly delightful and friendly place it is! The food is traditional Creole, tasty and varied and while the fresh iguana curry is optional, though I strongly suggest you try it, the fresh conch fritters are amazing. 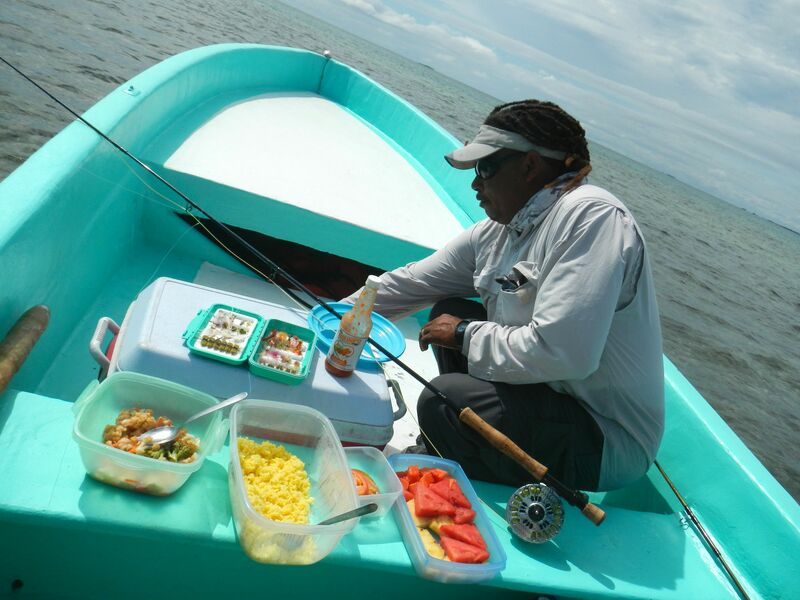 The beer is cold, the local rum outstanding; what more do you need for a weeks fly fishing in the tropics? Our arrival coincided with a couple of days of unseasonably heavy rain showers but true to form our guides, all of whom are now good friends, still managed to put us on fish each and every day. Throughout our week the weather got progressively better, and for the second half of the week it was perfect. LUNCH IS SERVED, DON’T FORGET THE HOT SAUCE! 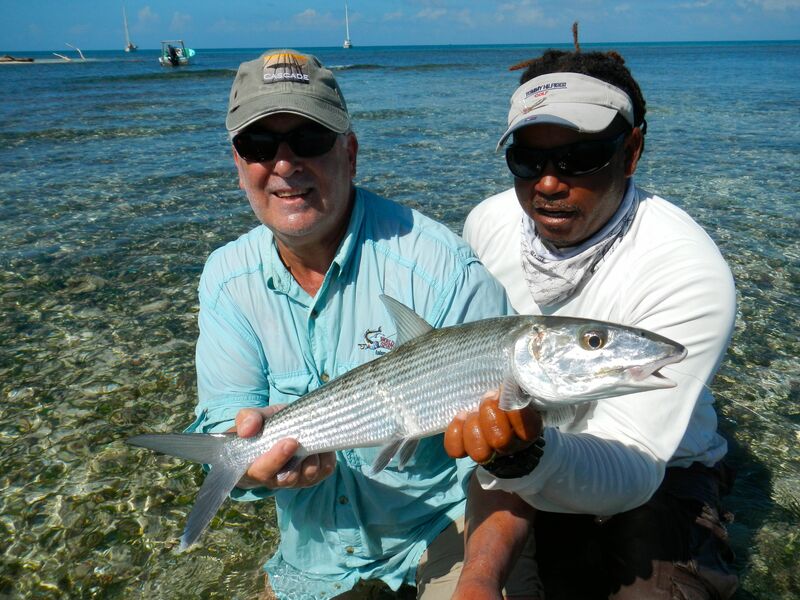 During previous trips to Belize we have focussed on and caught plenty of bonefish on the fly, and once again this was the case. 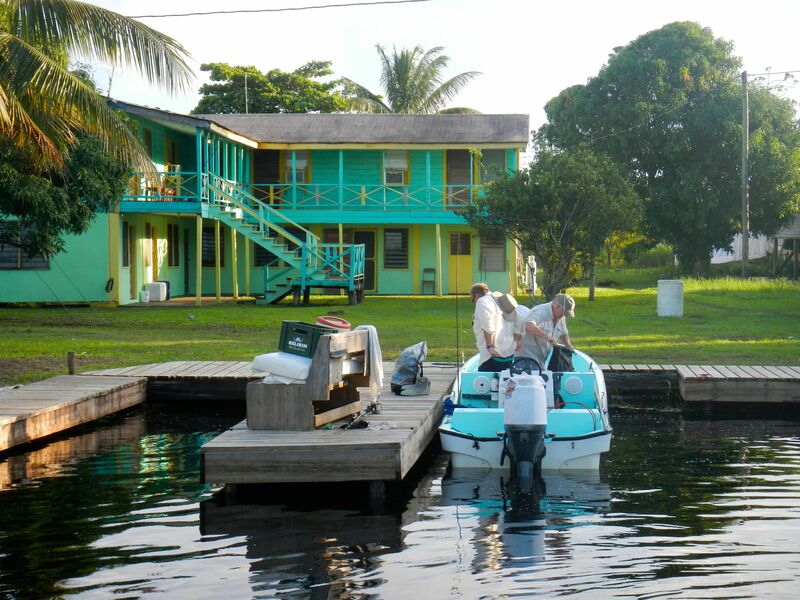 The very best bonefishing is out on the Sapodilla Keys, where the size of some of the shoals of tailing fish on the flats have to be seen to be appreciated. 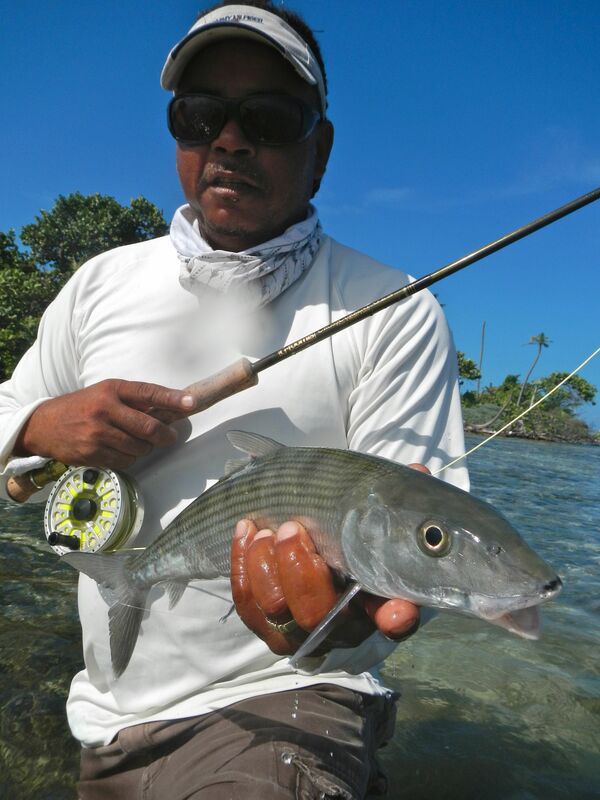 I honestly don’t know exactly how many bonefish were caught, but the numbers were truly staggering. On some of the flats you can stand and sight cast to bones over hard white sand pretty much all day without moving. 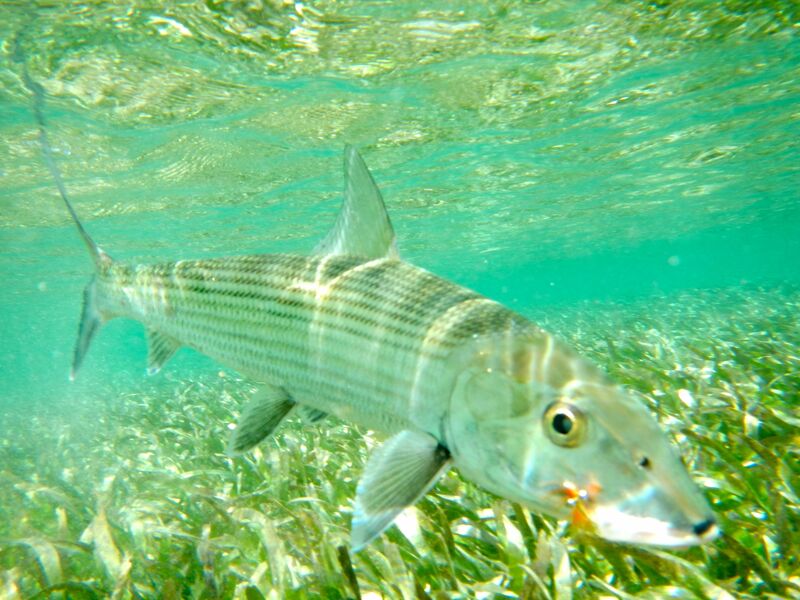 The average size of bonefish in Belize is 1-2.5lb but each day you’ll get multiple shots at much bigger fish. I believe our biggest fish this trip was a five pounder caught by Ray Jennings. Tarpon fishing, too, was spectacular with exciting shallow water sight fishing for fish averaging 10-40lb, great sport on a 9wt, along with occasional shots at much bigger fish; I’ll be taking a 12wt next time. Variety came by way of snook, various species of jack and the inevitable barracuda’s. 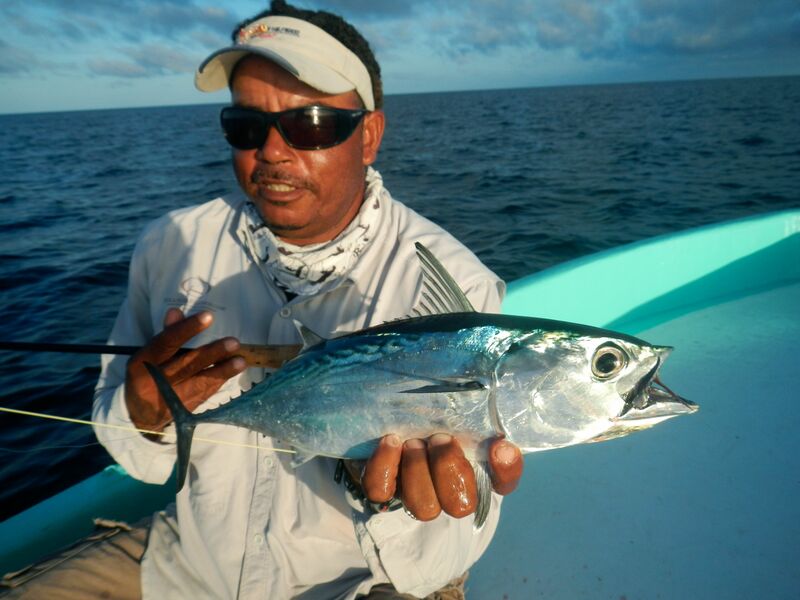 Each evening if fishing north of Monkey River we had the opportunity to fish for immense shoals of surface feeding little tunny, and how they run when hooked all but next to the boat on a fly rod! 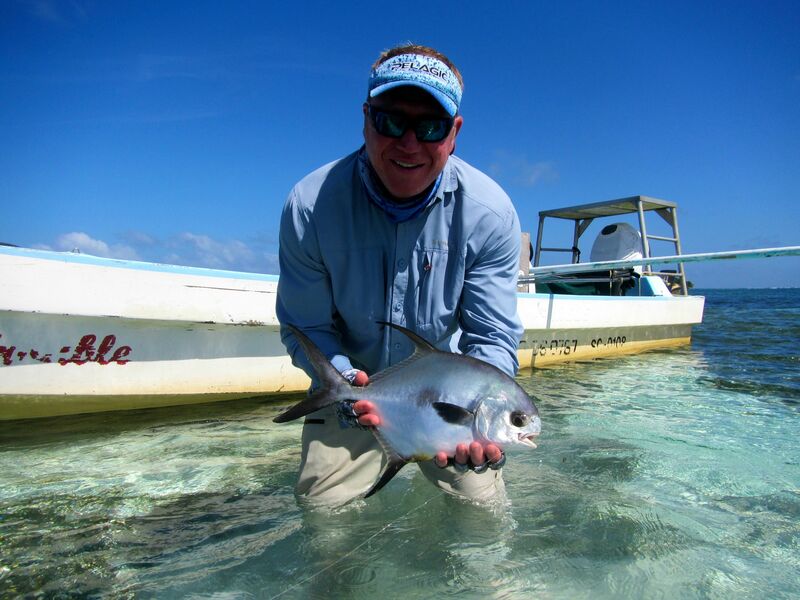 Of course Belize is one of the very best places to catch permit on the fly, and if you target them with bait they are pretty much guaranteed. Each day fly fishermen can expect plenty of shots at these spookiest of fish and one of our group, Darius Smulkstys, enjoyed a tremendous last afternoon fishing hooking three permit on fly, loosing one to a snapped hook and landing two. Sadly he could not catch a tarpon to complete his slam. That evening at the bar he was totally unbearable, but there is no denying he had earned full bragging rights! JUST LOOK AT THE SIZE OF THIS SCHOOL OF BONEFISH, BARELY AVERAGE FOR BELIZE! River is about as remote as you can get in Belize, yet the efficiency and genuine concern of all involved in this unfortunate incident was absolutely first class. As a result our client was transferred to suitable medical facilities with minimal delay. Thankfully he was suitably insured, a timely reminder for all of us who love to travel and fish. 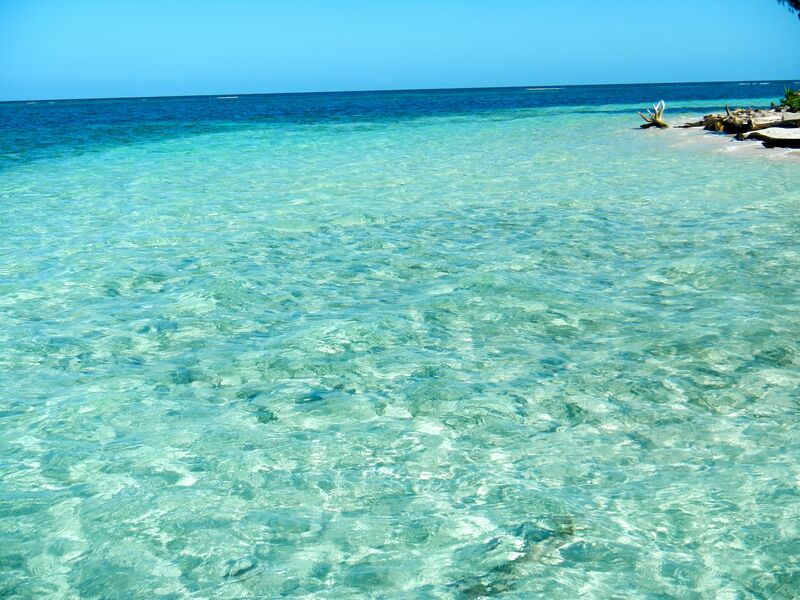 We are planning another trip to Monkey River, Belize in autumn 2014. Already we have several places confirmed so if you are interested an early enquiry is advised. Of course individual trips can also be arranged, contact Anglers World Holidays on Tel: 01246 221717. Currently planning a return group trip there later this year, what are you suggesting?